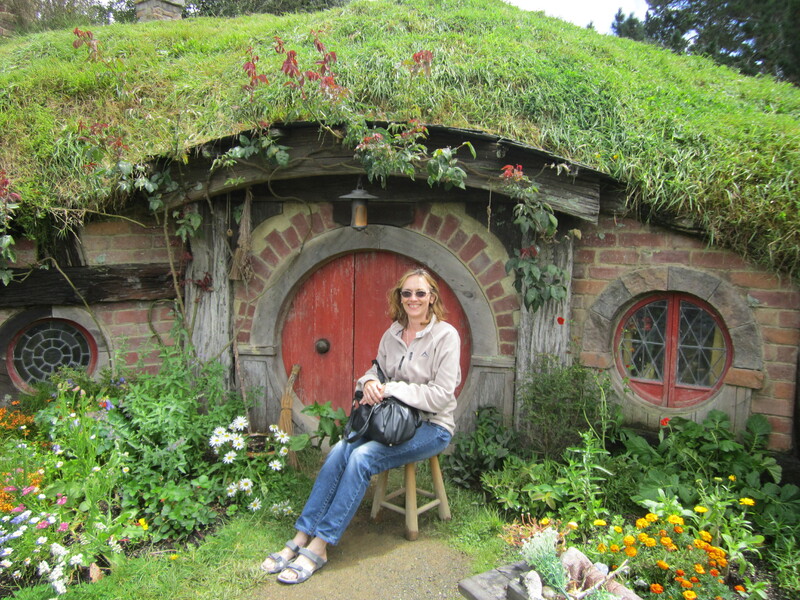 One of the highlights of my recent trip to New Zealand was a day spent at Hobbiton. As a fan of both Tolkien’s writing and Peter Jackson’s films, I had to see it. My niece cleverly slotted the excursion between an overnight stay with friends in the hills of the Coromandel Peninsula and the first evening of the Chinese Lantern Festival in Auckland. We left our Coromandel friends early in the morning and drove south to Matamata. As is always the case in New Zealand, the weather threatened to douse the day, but as we quickly learnt from the New Zealanders, the weather changes every ten minutes and once you accept that fact, you just get on with things. Hobbiton is easy to find because it is well signposted, and the sun smiled down on us as we entered the car park. We were booked on the 11h30 tour, but there was plenty to see before our bus arrived. In fact, it was tempting to spend my last few (preciousss…!) New Zealand dollars on mementoes of Gollum, Frodo and Bilbo, but I managed to restrain myself. Sort of. At least until after the tour. As our bus (called Gandalf the White despite its dirty windows) took us up over the hill, the driver pointed out various areas that had been used for wardrobe, make-up and catering vans, and told us ridiculous stories about the local sheep whose moment of film glory had been snatched from them. Apparently another breed of sheep had been brought in as extras by Peter Jackson because he thought they looked more like Hobbit-sheep. When our bus reached the out of sight second car park, our guide took over. The first thing he made each of us do was to pick up an umbrella from the shed next to the car park. He knew we would need them. We did, but not for the first ten minutes or so. What can I say? 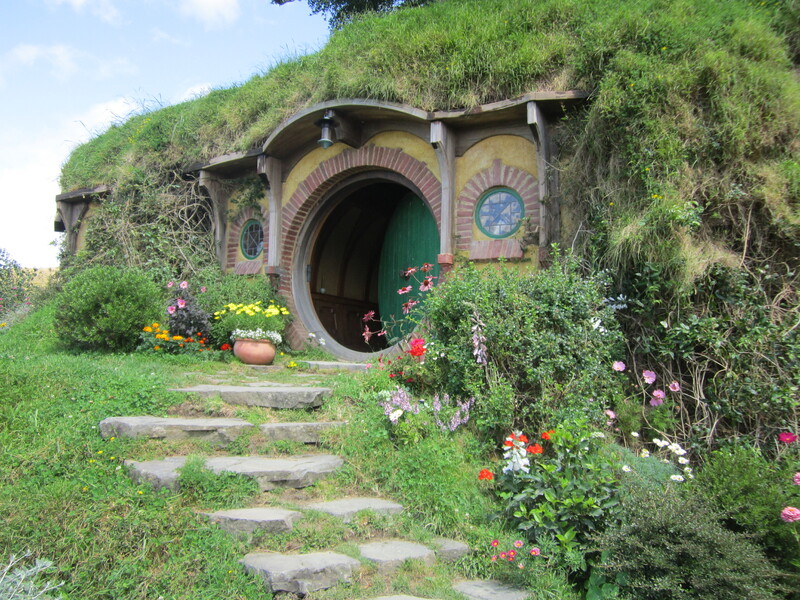 We did the regular tourist thing – shuffled along the paths, taking happy snaps of ourselves with our nearest and dearest in front of a variety of Hobbit houses all built artistically into the hillsides, complete with painted round doors and beautifully arranged gardens. It rained a bit but we scarcely noticed. Every photograph I have of myself from that day shows me smiling from ear to ear like a delighted child. We hung over gates, poked our heads into the hobbit-holes we were allowed to enter, and zigzagged our way up the hill past the pond, the sunflowers and veggies, the smoking chimneys and the wash-lines, to Bagshot Row at the top. Bilbo and Frodo’s house, Bag End, boasted a beautiful view back over the village, the party field, the lake and the bridge across it to the Green Dragon Inn. A team of full-time gardeners went discreetly about their business while we ooh-ed and aah-ed over their handiwork and the handiwork of the set-builders whose work has been turned into the most satisfying of theme parks. I hesitate to use that phrase “theme park” because Hobbiton doesn’t come with rides and Hollywood-style side-shows; it is kept as naturally as possible, notwithstanding the fact that it was created from an empty rolling hillside on a remote sheep farm over a decade and a half ago. By now you probably think that this post doesn’t have much to do with writing. It does, however, have to do with something that is of prime importance to writers – creating worlds and making them come alive. Tolkien created the world of Middle Earth, including the Shire where the hobbits live in the village of Hobbiton. It is the epitome of a pastoral paradise from another age; an age that never existed but could have done because it is so real. The visual impact created by Tolkien’s books is so strong that a universal imagery has sprung up from his words. In the decades following the first publication of his epic Lord of the Rings, this world was depicted in drawings and paintings by many artists. Among these were twin brothers Tim and Greg Hildebrandt who produced three painted Tolkien calendars in the late 70s; Canadian fantasy illustrator John Howe, who had himself been influenced by the Hildebrandt brothers while still in his teens; and Alan Lee, an English artist whose 50 watercolours of LOTR were incorporated into an illustrated version of the book in 1991. Howe and Lee were the artists that Peter Jackson chose to develop the conceptual art for the LOTR film trilogy, and were influential in choosing the location for Hobbiton. Jackson and his team travelled from Wellington to look at the farm outside Matamata as a possible location, and took Howe and Lee with them. On arrival, both artists immediately began to sketch the landscape, putting in the fictitious hobbit houses, chimneys, roads and hedges. The reality of Hobbiton was born. Once Jackson had decided that the location was perfect, his team set about building the village. Facades only, of course, because all interiors were shot inside the studio in Wellington. The set creators also planted flowers, shrubs, vegetables and trees which were then encouraged to flourish. Paths were cut, hedges grown, and then flowers and weeds allowed to ramble and grow over them, as if the greenery and the village had been there for centuries. 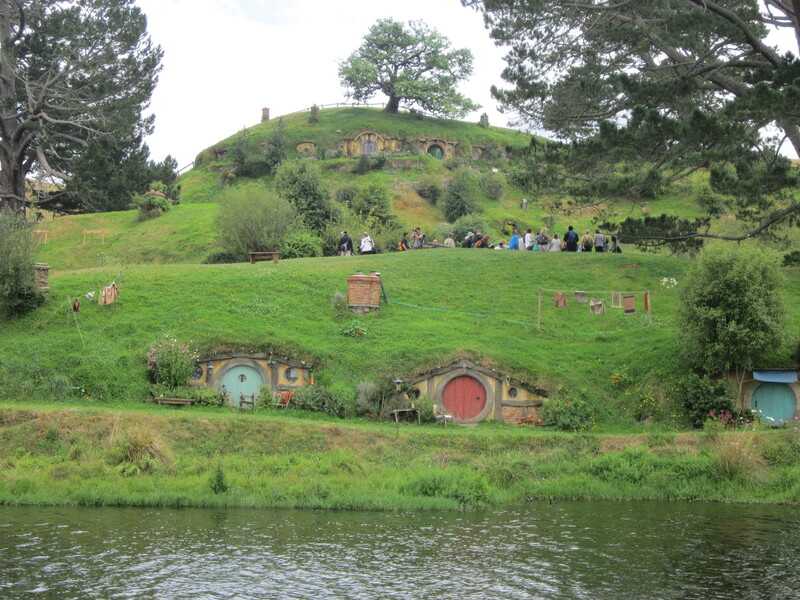 Man-made additions included extending the lake and building a rustic bridge across it; a man-made pond (from which a colony of noisy frogs had to be re-settled beyond the hill each day before filming began); and a hand-decorated, purpose-planted, huge tree above Bag End itself. 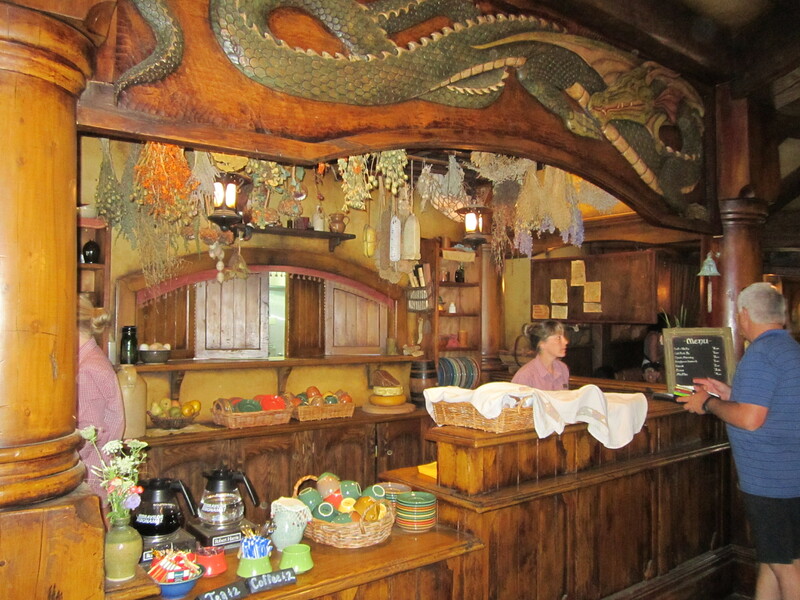 A more recent addition is the gloriously reconstructed Green Dragon Inn where refreshments are served after tourists have finally finished their tour. This last need arose since the site became a tourist attraction. In the original LOTR films, the inn was also a facade with the interiors filmed in a Wellington studio, but due to the now constant demand from thirsty tourists, a new version of the inn was constructed from scratch and made completely practicable. As I sat sipping my complementary ginger beer in the Green Dragon, I thought what a pity it was that Tolkien was no longer alive to see this three dimensional version of his village of Hobbiton. I’m sure he would approve of it, and I can’t think of a more flattering legacy for a writer than having his world not only faithfully recreated for a film, but left there and looked after for visitors and lovers of his books to enjoy as well. How many writers ever get that lucky? This entry was posted in Susan Roberts and tagged Alan Lee, Hobbiton, John Howe, Lord of the Rings, Matamata, Peter Jackson, Tolkien. I enjoyed reading your piece of writing and enjoyed the photographs even more. An awfully big adventure I would call it, Make-belief worlds are so much more exciting and interesting than our every day world. Thank you, Brigitta. It was an awesome adventure to be there. 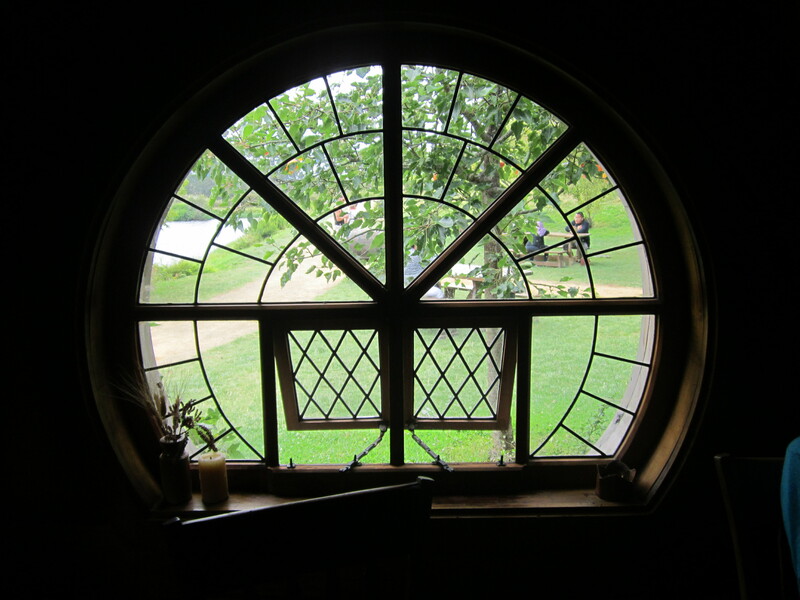 I think I’ve wanted to live in a hobbit-hole ever since the first time I read “The Hobbit” more than thirty years ago. I have to agree with Brigitta Susan, a lovely fantasy world – thank you for sharing it with us. I love it when things like this are as imagined, or better. Sometimes touristy things are money spinning junk yards. So glad this one wasn’t!